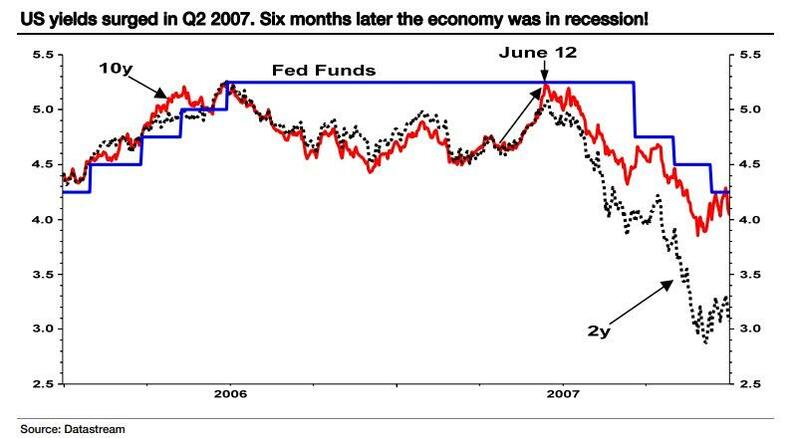 Albert Edwards: Why The Next Recession "Might Only Be Six Months Away"
To Edwards this is a familiar question because as he explains, it is "exactly the same bold heading box I wrote in my Global Strategy Weekly of 13 June 2007." As he recalls, "the rout in the bond market back then was even more savage than it has been in recent weeks, with the 10y yield rising from 4¾% in mid-May 2007 to the 5¼% peak on 12 June, just one day before I wrote the words above, pondering the possible end of the secular bull market for Government bonds." 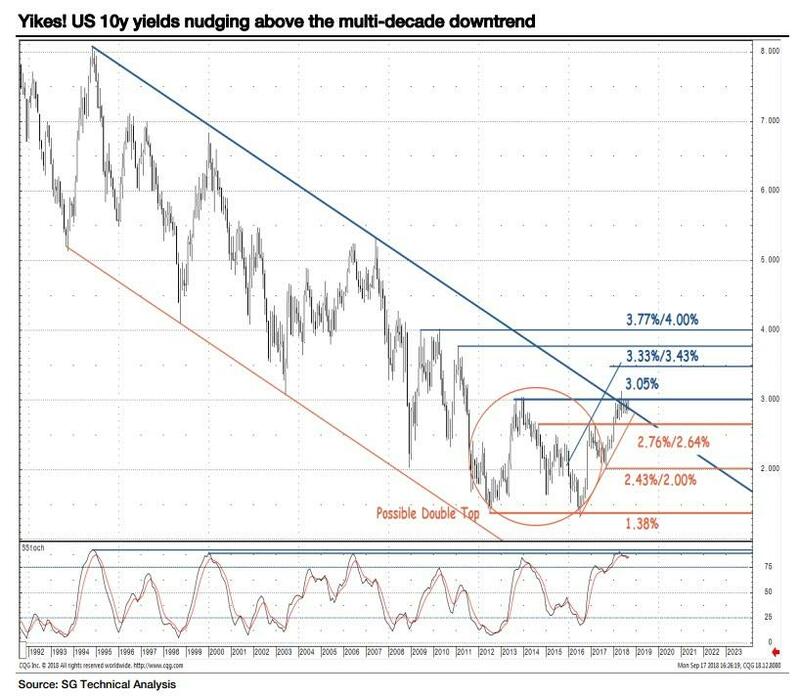 Furthermore, just like now, yields were also set to break out above the secular downtrend and respected bond investors such as Bill Gross were, just like now, calling for the end of the secular bull market. 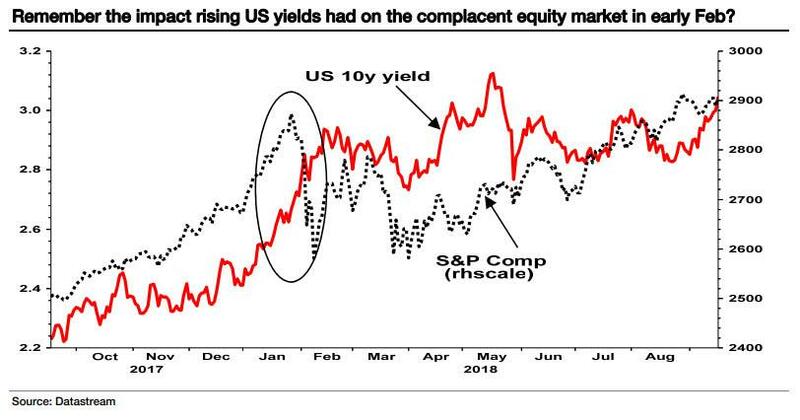 Referring to a chart from SocGen's head of technical analysis, Edwards points out that the break in the 10y above 2.8% was not the key level that could mark the end of the secular bull market, but rather it was the 3.05% zone as shown in the chart below. Indicatively, earlier today the 10Y hit 3.09% after reaching as high as 3.11% yesterday. But while technicals may justify a major move higher in yields, the fundamentals paint a mixed picture at best. On one hand, Edwards reminds readers that the Citi Economic Surprise Index for the US had slumped back towards zero, a convergence which he notes "normally means yields should have continued to paddle sideways around 2.8% - and yet we have seen this dramatic rise." 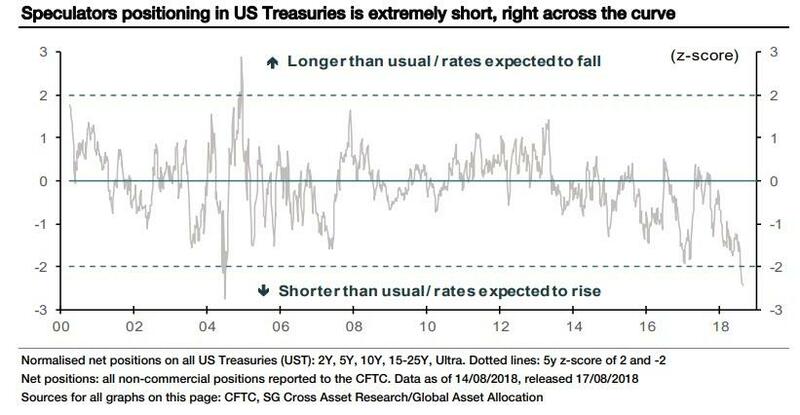 Another observation suggesting the breakout may be false is the massive extreme spec short positioning in Treasuries: "in that context this sudden sharp sell-off is most surprising" Edwards writes. First, the SocGen strategists writes that while he has always warned of the risk that US wage inflation would blast upwards, "despite the robust August wage data and a stronger oil price pushing up headline inflation, in an eerie echo of June 2007, it is real yields, rather than inflation jitters that have propelled the US nominal bond yield higher." "In the latest FOMC SEP median path, by the end of next year, the federal funds rate is projected to rise to a level that exceeds the longer-run federal funds rate during a time when real GDP growth is projected to exceed its longer-run pace and unemployment continues to fall. The shift from headwinds to tailwinds may be expected to push the shorter-run neutral rate above its longer-run trend in the next year or two, just as it fell below the longer-run equilibrium rate following the financial crisis. Notably, the sizable fiscal stimulus in the pipeline is likely to continue to bolster the short-run neutral rate over the next two years. The relatively rich level of current asset valuations relative to historical levels is another factor that could push the short-run neutral rate above its longer-run value." To Edwards, this suggests that the market has been too sanguine about the Powell Feds preparedness to hike rates to arrest the financial market bubbles created by his predecessors. So going back to the last time Edwards saw just this kind of move in yields, he notes that when reviewing his thoughts back in June 2007, "what is most interesting is that the sell-off then was driven by exactly the same thing that it is now - namely sharply rising real yields on the back of stronger economic data while inflation expectations were remarkably unmoved. Then, like now, enthusiasm on US growth was reaching its heady climax. " In fact, as Q3 progressed yields slumped towards 4% as the market began to sniff the recessionary vapors in the air. Equities ignored the signs of course, and made new highs in October '07 a few weeks after the Fed's first rate cut. But by December, less than 6 months after the June peak in yields, the US economy had entered the very worst of recessions. Might history repeat itself? One doesn't have to go all the way back to 2007 to see a similar episode: in early February, similarly strong wage data spiked bond yields higher causing a temporary slump in equities, and resulting in the unprecedented VIXplosion. So while we ponder whether the bond bull market is really over (which I doubt... at least yet), the more immediate concern should be what level of bond yields will trigger an equity market slump and whether against all expectations a recession might only be six months away just as it was in June 2007.